If you are running the ARDroneUbuntu virtual machine, updating the tutorial will download the above updates and fixes. The AR.Drone is a quadrotor that can be flown from any WiFi enabled device with an appropriate application – most commonly an iPhone or Android phone. Unlike other quadrotors, which can be difficult to fly manually, the AR.Drone is equipped with onboard sensors and controllers that stabilize the vehicle while flying and give it the ability to hover on a spot and await the next command. Because of this onboard stabilization, the AR.Drone is becoming very popular as both a toy (it can be flown by even the most inexperienced pilots), and as a research platform for computer vision and robotic exploration (researchers can focus on their algorithms without worrying that the drone will crash). ROS, the “Robot Operating System”, is a software framework that enables the development of robotic applications – applications that control and interact with robots. A large number of groups using the AR.Drone for research purposes, use ROS to control the drone, which is why we are focusing on it here. For these tutorials, we will be running the ROS software and AR.Drone controllers using the Linux operating system. To get started, we’ll be downloading an “Xubuntu Virtual Machine”, which has been created especially for these tutorials. This virtual machine package contains everything that you need to get up and flying – fast! To run the virtual machine package, you will first need to download and install the free Virtual Box software. You will also want to download the ARDroneUbuntu virtual machine package. Once you have Virtual Box installed, double click the ARDroneUbuntu.ova file that you downloaded. This will open it in the Virtual Box program. A settings/import dialog should open. You should leave these settings as they are, unless you know what you’re doing. After completing the import process, click start in the Virtual Box program to begin running ARDroneUbuntu. Congratulations, you’re now running Xubuntu 12.04 (username: ardrone, password: ardrone)! This has been preconfigured with all the software required for this series of tutorials, so you’re now good to go! Update Tutorials – this will update the AR.Drone driver and tutorial source code, it will also install new tutorials once they have been released. Great, now that you’re up and running, lets update the tutorial files. Click the Update Tutorials (#4) button in the launch bar. This will launch a terminal window in which it will download and install any required software updates. You should be connected to the internet for this step. Now you’re ready to fly and can skip the next section of the tutorial. I’ll assume you understand enough about linux to follow the ROS installation instructions (summarized here). I also assume you are running Ubuntu (or a deviant). If not, you should modify the apt-get commands to suit your system. This will install the joystick drivers which are used in a future tutorial. If TAB does not autocomplete the above-indicated command, or if rosmake reports any failures, you may have a problem with your installation. If this is the case, you should check the installation guide linked above. If you’ve completed all of the above successfully, you’re ready to move on! We are now going to fly the drone. Flying inside can be dangerous. When flying inside, you should always use the propellor-guard and fly in the largest possible area, making sure to stay away from walls and delicate objects. Even when hovering, the drone tends to drift, so always land the drone if not being flown. I accept no responsibility for damages or injuries that result from flying the drone. If you have a laptop and are thus able to fly outside, check the last section of this tutorial for instructions on reconfiguring the drone. Great, we’ve got the software, now lets have some fun! Turn on the drone and wait until the propellors vibrate, indicating that the drone is ready. Now connect your computer’s wireless to the AR.Drone’s network, just like you would connect to a normal wireless network. The network will be called ardrone<something>. * Advanced users: The drone acts as a wireless server and assigns itself (via its DHCP server) a fixed IP address of 192.168.1.1 and your wireless card an address from 192.168.1.2-255. For this reason, there can be routing issues if your ethernet card is also in the 192.168.1.0 subnet. Pressing TAB at various stages throughout the command should autocomplete. If this is not the case, or if this command causes errors, check that you have setup your .bashrc file as per the ROS installation guide, and that you ran rospack profile after cloning the two git repositories. This exception is a Python bug and won’t affect the program. Within a few seconds, the output should progress well past this stage and begin printing configuration messages as the initialization of the AR.Drone progresses. If this is not the case, check the wireless connection to the drone, and check that any network cables have been unplugged from the computer. If the keyboard controller launched successfully, you will now be seeing a live video stream from the drone. If this is the case, we’re ready to fly! 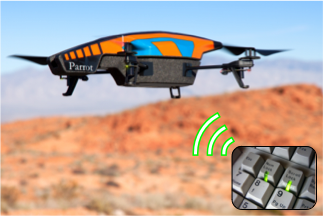 Note: Pressing the Spacebar will toggle the drone between an emergency state (all onboard LEDs are red), and the ready state (all onboard LEDs are green). If your drone isn’t responding to commands, make sure it is in the ready state! With that said, I now hand the controls to you. Remember to keep a thumb on the Spacebar at all times, just in case something goes wrong. Will print the data packets that are being sent back from the drone at 50Hz. Will toggle the drone’s video stream between front and bottom cameras. Will plot the x and y acceleration on one plot, and the estimated x and y velocity on a second plot. And have a look at the various tag detection data that is returned (you have to be holding tags in front of or below the drone for this to work). By default, this launch file configures the drone to detect Orange-Blue-Orange stickers on the front facing camera, and the A4 “Oriented Roundel” that comes with the AR.Drone 2.0 on the downward facing camera. If your stickers are a different color, change the launch-file parameter enemy_colors to 1 for Orange-Green-Orange, 2 for Orange-Yellow-Orange and 3 for Orange-Blue-Orange. By now you may have noticed that flying with the keyboard isn’t so easy. This is largely due to the binary nature of a keypress (not pressed/pressed), which translates into 0%/100% control. Although we could implement software remedies such as input windup based on how long the key has been held, this is for the most part only a band-aid solution; what we really need is an analogue input device. Enter the Joystick (or control pad). In the second tutorial of this series, we will be covering a little ROS theory (topics, messages and launch files), before installing a joystick, linking it up to the ROS system and then using it to fly the drone. For those of you interested in the source code or configuration, I will briefly discuss the various options below. We will be going into much more detail in the next tutorial. Full source code for this tutorial is available from the GitHub repository. This file brings everything together. The KeyboardController class implemented in this file extends the DroneVideoDisplay class, adding a keyboard handler for control. Key mappings are defined in this file and can be changed to suit your preferences. For more information about configuring the AR.Drone, have a look at the AR.Drone driver’s readme. I hope you’ve had fun with this tutorial and I look forward to bringing you the next one in two weeks time! If you have any questions, or comments about what you would like to see in the next tutorials, please send me a message or leave a comment to this post! You can see all the tutorials in here: Up and flying with the AR.Drone and ROS.